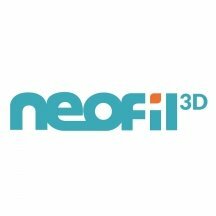 Neofil3D offers you high-quality filaments at an attractive price with these high-quality filaments being available in numerous colours and materials. These high-quality filaments allow you to produce high-quality and flawless 3D prints. Neofil3D filaments are tested laser which ensures regularity in the filament diameter to ensure an unimpeded printing. Makershop3D recommend the Neofil3D brand for large amounts of printing because Neofil3D filament has the advantage of being easy to use and ensuring excellent print quality. For any questions please contact our technical team. Neofil3D offers 3 ranges of filament, first is the PLA filament which is made from starch and has the advantage of being very easy to print and odourless. Neofil3D also offers ABS filament which is widely used in industry because it has the advantage of having a high resistance while still retaining excellent flexibility. Neofil3D ABS filament is used to create cogs or gears withstanding mechanical stress and that are exposed to heat. Neofil3D has a range of M-ABS filament. This filament is aimed at professional users who want a high-quality filament with the same properties as ABS filament. The whole range suffers from less deformation, which allows for very accurate print quality. Neofil3D offers 2 different diameters for its filaments, a diameter of 1.75mm and another of 2.85mm in order to adapt to all types of FDM 3D printer on the market, like Ultimaker, Tobecaor FlashForge. Neofil3D filament is available in 16 different colours to meet all your needs. Neofil3D seeks to simplify your life which is why each of its spools is transparent, allowing you to check the status of these in an instant. Neofil3D spools and packaging also carry very useful information like the print temperature, the plate temperature and the filament diameter as well as the ease of printing and mechanical resistance of the spool. Finally the PLA filaments from Neofil3D are natural, harmless to health and odourless, as well as being 100% biodegradable. Neofil3D Red ABS 2.85mm is excellent quality for printing durable prototypes. This very opaque ABS is optimised for mechanical parts. 750g spool. Neofil3D Apple Green ABS 2.85mm is excellent quality for printing durable prototypes. This very opaque ABS is optimised for mechanical parts. 750g spool. Neofil3D Yellow ABS 2.85mm is excellent quality for printing durable prototypes. This very opaque ABS is optimised for mechanical parts. 750g spool. Neofil3D Orange ABS 2.85mm is excellent quality for printing durable prototypes. This very opaque ABS is optimised for mechanical parts. 750g spool. Neofil3D Dark Blue ABS 2.85mm is excellent quality for printing durable prototypes. This very opaque ABS is optimised for mechanical parts. 750g spool. Neofil3D Dark Green ABS 2.85mm is excellent quality for printing durable prototypes. This very opaque ABS is optimised for mechanical parts. 750g spool. M-PVA is a Premium support filament for 3D printing using double extrusion. It can be used to produce parts that require support and is removed by immersing the object in a pan of cold water. Comes in a 500g spool. Neofil3D Transparent PET-G is a robust, hydrophobic, translucent filament. This filament also has excellent impact resistance and very good flexibility for high-quality prints. Comes in a 750g spool. Dark Grey Carbon-P is an alloy of PET-G and carbon fibres. This unique blend allows Carbon-P filament to have the rigidity of PET-G while increasing its resilience to impacts and high temperatures. Comes in a 500g spool. White PC-ABS from Neofil3D is a filament that combines Polycarbonate and ABS which makes it very resistant to impacts while retaining good dimensional precision. Comes in a 750g spool. Light Wood filament from Neofil3D is a modified PLA-based filament that provides prints with the feel and smell of wood. Very easy to print even at low temperatures. Comes in a 500g spool.